Here we are … full circle for the 6th time … a Calas spring ! As we get ready to open the old park gate … hopefully polished a bit … and we now have a good idea on how the Park will start out in 2015, we wanted to give you an update on the changes being made as well as those planned in the next couple of months. As always we’d like you to explore on your own to discover the changes … grand and minute. That said, here are a few ‘peeks’ of what has been accomplished so far this month. 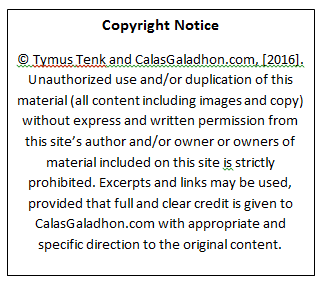 Most of the changes you will see are on the Calas Galadhon and Glanduin sims. We’ve not had time yet to even touch the northern sims other than to remove the Santorini build on Armenelos. It has been packed up safely … like the Glass Pavilion we had on the Bay of Belfalas sim in 2013. Truck took care to put all in a Rez Faux box for easy rezzing should we do so again in the future. Last year as we prepared to reopen from our winter break on Valentines Day we announced that because of RL responsibilities in both finances and time, it seemed likely we’d need to cut back on the number of sims. Our group members and visitors rallied around the cause to keep the park sims intact for the remainder of 2014. Everyone was so very supportive. Considering that Truck and I had to cut back our finances by more than half at the time, it was an amazing accomplishment to say the least. Although because of summer vacations, the holidays, etc., some months were higher than others, the ten month average of total cost covered from donations from March through December was an amazing 67% ! I’m guessing there are few public sims or estates that can claim they are supported by their visitors to this extent. 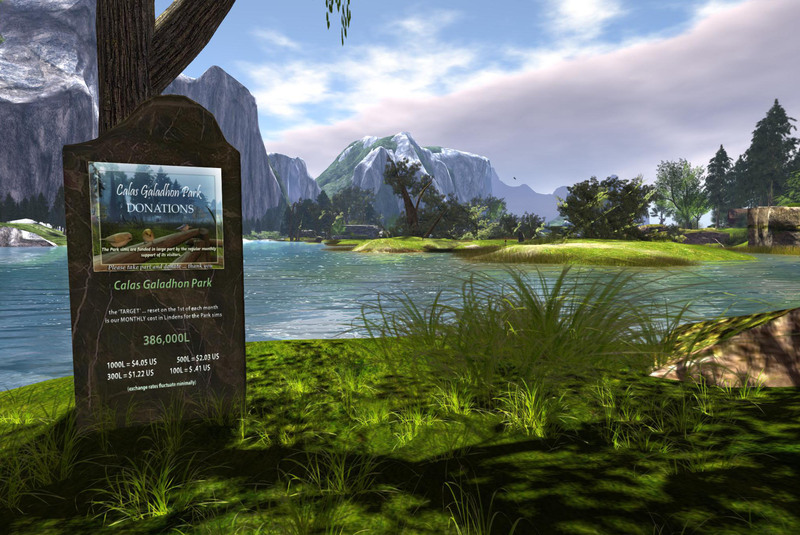 We can never express enough how very grateful we are for the support of those who were able to participate and keep the park sims of Calas Galadhon together through 2014. During the last couple of months Truck and I have thought a great deal on how to approach our work with ‘Calas’ this year. Funding the park continues to be a big concern for both of us, but for me in particular, its also the amount of time we spend keeping the sims looking their best while creating our special seasonal builds like this year’s DARKWOOD and NOEL. 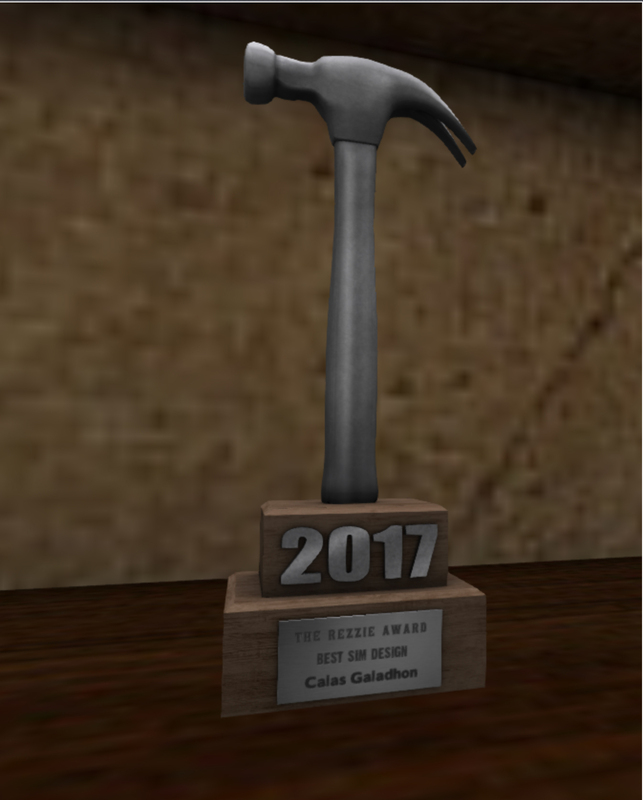 At times I seemed to be running in place to get things done in time. Poor Truck , Kerena, Alicia and Romie had to put up with me stressing out at times … lol Don’t get me wrong … Truck and I love what we do here … it is certainly a lot of work, but it also brings joy and personal satisfaction when we see how much others appreciate and enjoy Calas. Good news: If you have looked at the World Map recently, you will notice that for now we felt we could keep ALL of the sims. We have filled out a perfect rectangle on the grid once more … 12 sims again … with a new ‘openspace sim called ‘LONG LAKE’ (named for still another location in the works of J.R.R Tolkein). ARMENELOS has been moved to the far NW corner of the Park with LONG LAKE placed between it and MISTY MOUNTAINS. Although we won’t know for sure until we start to work on these northern sims in February / March, we envision LONG LAKE to be a mostly water sim (added space for boating & vistas) but also as a land bridge in between ‘MISTY’ and ARMENELOS. Once completed,one should be able to walk (or ride) around the entire park. As I mentioned in a previous post our plans for ARMENELOS (possibly renamed at a later date) is to create a new wooded sim … basically MISTY MOUNTAINS on steroids 😉 I’m excited to get started. We have learned so much since first building MIRROMERE & ‘Misty’. Once the new wooded sim is complete it may be that we will need to ‘convert down’ the existing Misty Mountains to another ‘openspace’ region to keep the cost of the park close to what we were paying for it in 2014. If donations continue to go well, there is also a possibility we could keep ‘Misty’ as a ‘homestead’ region. We’ll just have to wait and see. Again, no work has been started on these two regions yet. When you return you will only see The Dolphin Café (which will be remodeled to fit the theme of the new build and work signs surrounding all. We have kept our beautiful OZ Nighclub above Armenelos. For now your Landmark for OZ Nightclub will work. While we hope to start back up our live music schedule in March, you are still welcome to use ‘OZ’ for dancing. If The Dolphin Café’s facelift is not complete by March, we may be holding it’s shows at another location until all is done. Below you will find a snapshot of the new Donation kiosk placed around all sims. The new system has been simplified to show the monthly Park total …rather than the total donated at each sim as the old kiosks displayed. I think they also look a lot nicer than the old black ones 😉 This new system is much easier for you ( and for us ) to keep track of how the total Monthly support for the entire Park is doing. In addition, because the new system is now web based, you will be able to check the monthly donation totals via our website . Romie will put the link in place when we reopen. Because I had some RL downtime for a few days which put us behind a bit, it may be that we won’t reopen until Saturday, Feb 7th. I say that only as a possibility. We will do our best to open before then. We’ll update you again next week. As we are all too familiar … in RL and SL … nothing is for sure … or forever … but we can look forward with some hope and optimism about the possibilities ahead.